This type of collector is mainly used for swimming pool heating and consists of black coloured matting or tubes made from rubber or plastic based materials through which the pool water is circulated. Such panels are effective at heating large volumes of water by a small temperature rise (perfects for pool) during warm sunny conditions. 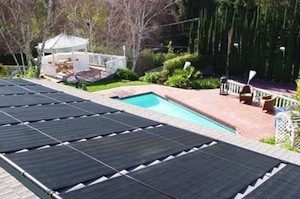 In hot sunny regions such panels have also been used for domestic hot water supply. As this type of collector is not insulated it can't efficiently operate in cooler conditions or when hotter water (showering temperature) is required. Such collectors are often referred to as "unglazed" as they don’t have a glass cover like flat plate or evacuated tube collectors. This name, however, can cause confusion with the next type of collector "concentrating" outlined below which also are "unglazed", but very different in structure and operation. When high temperatures (>120oC / 250oF) are required, such as for steam production, concentrating collectors are often used. 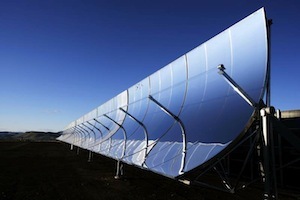 A concentrating collector uses mirrors to concentrate the sunlight onto an absorber tube or panel, allowing much higher temperatures to be reached. Such collectors normally require 1 or 2 axis tracking to follow the sun and ensure optimal reflection angle. Due to the size and complexity of these systems they are primarily used for large scale projects. al collector for domestic hot water applications. The design is very simply an insulated box with a absorber sheet welded to copper pipe that the heat transfer liquid circulates through. While the basic design concept is fairly consistent amongst manufacturers, there are differences in aspects of the design that can improve performance, make the panels lighter, easier to install and suitable for different installation formats, and ultimately impact on the cost, efficiency and longevity. Flat plate collectors perform well in warm climates and when achieving temperature for basic domestic hot water use (<60oC / 140oF) . No insulation above the absorber is an inherent disadvantage of the design and leads to high heat loss. This heat loss means flat plates are unable to deliver hot efficiently at higher temperatures (>70oC / 160oF), and performance is greatly reduced in cold weather. 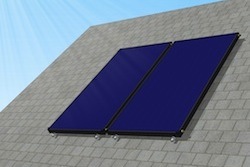 For more information on Apricus Flat Plate Solar Collectors click here. Evacuated tubes are comprised of an array of single or twin wall glass tubes with a vacuum that provides excellent insulation against heat loss. The design is very similar to a glass hot water flask used to keep hot water in. Single wall evacuated tubes normally have a fin that has the absorber coating, similar to that used in the flat plate collector. Twin wall evacuated tubes have the absorber coating on the inner tube and the space between the two tubes is “evacuated” to form the vacuum. Apricus uses twin wall evacuated tubes as they provide some advantages over single wall tubes. For more detailed information on evacuated tubes click here. 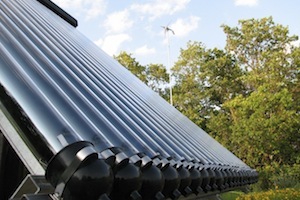 For more information on Apricus AP Evacuated Tube Solar Collectors, click here.